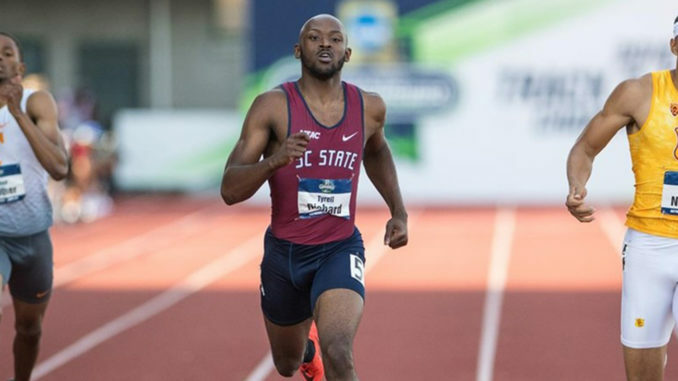 SC State University senior sprinter Tyrell Richard recorded the world’s top time thus far this year in the 400 meters in helping the South Carolina State track teams to a solid at the North Florida Track and Field Invitational Friday at Hodges Stadium. Richard captured the 400 meters in a time of 44.81, the top time in the nation and world this year and his second-best clocking all-time. The victory, which also established a facility record, continued the outstanding track season Richard is enjoying. The Georgetown native earlier won the 400 meters at the NCAA Track and Field Indoor Championship in a time of 44.82, the top time in the world in that event this season. Also grabbing firsts for the Bulldogs were senior Demek Kemp, the USAT&F indoor champion in the 60 meters, who captured the 100 meters in a time of 10.41; and Orangeburg native Daniel Seawright, who won the men’s long jump with a leap of 7.27 meters (23-10.25 ft.). Seawright, a sophomore, also finished fourth in the 400 meters with a time of 47.61 in his first time competing in the event. Other top performances for Coach Tim Langford’s team included a runner-up finish in the men’s 400-meter relay by the foursome of Kemp, Richard, Seawright and Malik Watson with a time of 39.89, second-best all time in school history; Breana Tyler, third in the women’s long jump with a leap of 5.77m (18-11.50 ft.); Austin Kemp, third in the men’s high jump with a leap of 1.96m (6-5 ft.). SC State also had six other top 10 performances, including a personal record toss of 35.23m (115-07 ft.) by Keturah Hunter in the discus.